Stevia sugar, Sucralose, Aspartame etc. Isomalto-oligo saccharide, erythritol, maltitol, xylitol, isomaltitol, maltodextrin, glucose, lactose, etc. 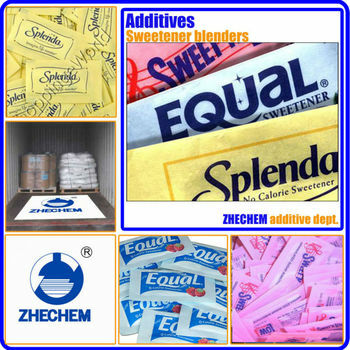 Intensive Sweetness:The products can be 20-300 times sweeter than sucrose. Solubility:Good dissolvability on cold and warm conditions. Cost-Saving:Based on our experiment data, our products can help customers reduce the cost of sugar usage by 35-90%. Target Customer: Be suitable for normal people and people with diabetes, obesity etc. who need sugar-free or low calorie diet.